Welcome to Bigger Picture Moments, a weekly writing event sponsored by Bigger Picture Blogs. We welcome you to join us in finding the Bigger Picture amidst the hectic, everyday craziness in your week. Melissa is hosting our link-up next week, so keep your heart open to the bigger picture and come back to participate again or for the first time. All are welcome! Browsing the aisles for back-to-school gear had my brain buzzing. Posters colored in school-bus yellow and chalkboard green towered above the bins of supplies, and the atmosphere was charged with excitement: the smell of school was in the air. Moms and students darted in and out of the rows, checking things off lists and discussing necessity versus desire. Because while I've done back-to-school shopping for ages, it's pretty new that we're shopping for my little one. Mia -- a preschooler. Her needs are basic and fun: crayons, markers, glue, kleenex. And even though we don't need piles of products like we will when she starts kindergarten next year (choke), we still needed enough new things that it felt like a party. A back-to-school shopping party. At home that night, we regaled daddy with stories of choosing just the right markers and how the new binder is PINK! He listened with perfect attention and enthusiasm, and then turned to me with a wistful look on his face. "You know," he said, "it won't be long now before it's time to think about Halloween costumes. Thanksgiving. And then Christmas. The school year starts and it all rolls right along, doesn't it?" I smiled and agreed. It just keeps going. One minute it's back-to-school, the next it's trick-or-treating. At 6-months old, Mia was crying. She wasn't sleeping when I thought she should be, she was still exclusively breastfed, and I was tired. In body and in spirit. Motherhood had slapped me around, shifted my life-goals, and frightened me. I was completely convinced that I was no good at it. Being a mother didn't come naturally to me. Leaving my crying baby in her room, I stormed out of the house. I rushed past my yard-working husband, sank down to the porch steps, held my head in my hands, and cried. Nothing was as it should be. I didn't know what I was doing, and I had a screaming infant to prove it. Calming my insecurities and frustrations took several minutes. And it didn't erase them, it merely tamped them back into their container, waiting to pop up like a jack-in-the-box next time things went wrong. Breathing a sigh of submission -- I'd have to go back in there soon -- I stared out over our neighborhood. Next door, two young kids were playing. The boy was kicking a soccer ball around while the little girl and her mother took off for a bike ride around the block. I watched them playing, laughing, talking, living, for several minutes. It struck me. It startled me. It gave me hope. Those kids -- those happy, playing kids -- had been babies once. They'd cried and not slept. They'd confused and worried their parents. Or, I could imagine that they had. And yet, here they were. Moving forward. Growing up. Every day wouldn't be this day, I realized. We wouldn't be stuck in this pattern of sleepless crying and confused schedules forever. I would feel more even-footed someday. My baby would grow up. She would move forward. Just like the kids next door. And now she's beyond those days. She doesn't cry at nap times anymore -- in fact, she barely even naps anymore. My wish has been granted. One minute she's a crying baby, the next she's picking out school supplies. 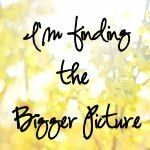 **Link up your Bigger Picture Moment below! Please make sure to use the link that will take us directly to your BPM post, linking back to us within your post, or your link will need to be deleted. I remember feeling the exact same way. My mom kept telling me it would get better, but I thought she was lying to me. For some crazy reason, I just could not believe that things would ever change. I thought I had just signed up for 18 years of crying and diapers. Little did I know 5 months later she would be sleeping better, and every couple of months thereafter she would improve. Now she's 1 1/2 and a sleeping champ! Not that other difficulties haven't arisen since, they definitely have, it's just that I now know to remind myself that it's only temporary and to TRY to enjoy as much as I can without beating myself up. but I'm a little thankful that I'm only buying one set of school supplies this year. her day will come before I want it to. oh those days I remember so well, and I too have cried, because they were crying and not sleeping and I didn't know what else to do. hey, sometimes I still cry, because they are crying and I still don't know what to do. but things change, not always easier, just different. My daughter is 21 months and while she's in the threshold of the Terrible Twos, I still can't and won't wish she was anything but where she is because despite it being so hard, I also know how fleeting all these moments are. Like you said, "One minute she's a crying baby, the next she's picking out school supplies." Great bigger picture moment, Sarah. "This too shall pass." I needed to hear that again right now, so thank you. The thing is, when we say that "this too shall pass", we usually say that to comfort when times are difficult. But it holds true for every moment, doesn't it? Both the bad and the good. So we should treasure each, without clinging or fighting too hard, so that we won't be too busy to catch the meaning that is in each one. Hard to do, though, isn't it? It does just keep in on rolling, preschool here is a little different, we are going to start in on the home education journey, so I think the nervous excitement is more me, for them it's just another day, but with lessons. I do understand the take your breath away realization that they grow way to fast! Sniff. Sniff. I feel this a whole lot. My baby -- the one who cried instead of napped what seems like only days ago -- just turned three yesterday. Hold me. Time just marches on; I know it's trite. But it's true. It goes and goes, and we're left with memories. Makes me want to make better memories tomorrow for the days after tomorrow. You really hit the nail on the head with this post. Beautiful. I know it was not your intent to made me cry, but you did. My little one is no longer a baby but a full fledged toddler and my big one is a preschooler. Although I'm homeschooling, I can still fell them growing up so fast. Thank you for sharing, such truth. Oh Sarah, I love this post. Honestly, beautiful.